A dog named Abby is lucky to be alive after a horse came to her rescue during her greatest time of need. Abby, a blind dog in Ukraine, escaped from his (her?) home and ran to a dock on the Danube river. He fell in and may have drown had it not been for a horse named Agripin. Agripin had actually been swimming when he saw Abby struggling to stay above water. The river was shallow enough for Agripin to quickly reach Abby, who climbed onto the horse’s back. 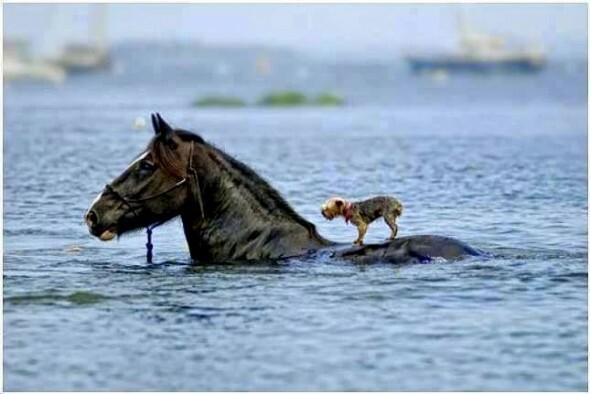 Agripin’s owner looked on at the astounding scene and saw the horse carefully bring the dog to safety on shore. This story happened in November of 2012, but sometimes it can take months for news to surface in other parts of the world. It is so sweet even it not true but I love the story.The horse is beautiful the dog is cute and adorable.